Deeply inherent psychological and behavioural biases can prevent managers from making rational decisions. However, the additional utility that can be generated by a fund manager is dependent not only on stock picking skill, but the ability and courage to reflect conviction in scaling portfolio positions. Low tracking errors are therefore clearly an impediment to value creation. Yet the tendency for managers to stymie their own performance potential appears to have become more dominant in recent years. 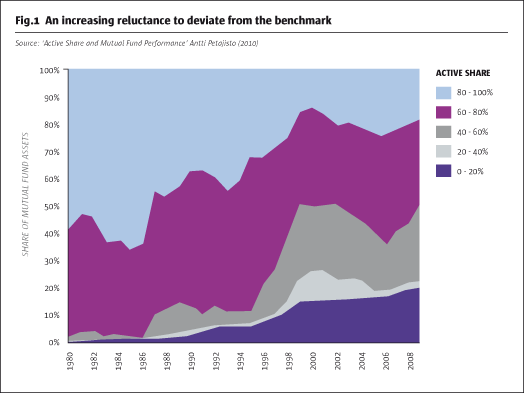 Significantly, as the chart above demonstrates, the proportion of mutual fund assets managed with an active (or benchmark-differentiated) share of 80% or more fell from over 60% to around 20% during the course of the three decades analysed, while the percentage of passively or quasi-passively managed assets increased from 2% to around 50%. A further study2 found that, since 1985, the average fund size, concentration in large cap (high beta) stocks and mean number of holdings has increased significantly, making it progressively difficult for fund managers to outperform their benchmarks. First conclusion: In order to enhance the prospects of alpha generation through stock picking, asset managers need to be encouraged to express real conviction in their stock selection. One way of achieving this is to provide them with the opportunity to operate within a risk framework that neutralises systematic exposures, thus ensuring that there is no motivation for asset managers to hold ‘benchmark makeweights’ that they have no strong view on. The asset management industry operates almost exclusively on the premise that successful stock picking is a product of talent. Not only is this almost certainly fallacious, the concept of worshipping talent is highly corrosive. As Matthew Syed, table tennis champion turned author and motivational speaker, astutely observes, ‘if we believe that talent is only marginally implicated in our future success, we are likely to persevere’.3 Clearly, Syed is seeking to inspire people to believe that anybody can do anything if they put enough effort in. However, the other side to this argument is that believing in our own talent constitutes a self-improvement disincentive. In fact, Carol Dweck, a social psychologist who has spent more than 30 years studying motivation, discovered that lauding an individual’s talent does not foster self-esteem and accomplishment, but has the opposite effect.4 She asserts that praising individuals for their intelligence fosters an ‘entity view’. They believe in their own intelligence but consider it fixed and stable. Consequently, they do not want to do anything that could make them appear less intelligent and are prone to giving up easily. Conversely, praising individuals for their endeavour encourages them to adopt an ‘incremental view’ (or ‘growth mindset’). They see intelligence as malleable and are therefore incentivised by opportunities to better themselves, believing that increased learning and strategic development will increase their intelligence (or skill). Academic research also demonstrates that human beings typically display overconfidence and our conviction in our own ability exaggerates the frequency of our correctness.5 However, this ‘overconfidence gap’ can be narrowed significantly when individuals are able to take a disciplined approach to weighing the evidence before making a commitment. Second conclusion: We believe that asset managers are likely to make more informed and better trading decisions if they work in an open environment of collaboration, in which their conclusions are challenged from a multiplicity of perspectives and where a growth mindset is positively encouraged. Daniel Coyle, a New York Times best-selling author, spent years visiting the world’s greatest talent hotbeds in sports, arts and business that produce huge numbers of extraordinary performers. He found that the secret is in the specific, targeted methods of training and motivation used in these hotbeds to build the high-speed neural circuitry that underlies all greatness.6 Similarly, at GLG, we are seeking to create our own hotbed, as we believe that skilled and experienced asset managers can be coached to become more effective stock pickers. This assertion is based on recognition that behavioural biases typically inhibit the performance of asset managers, especially in pressure situations. For example, we know that the best results will be achieved by running winning positions and cutting losers. However, as human beings we are naturally conditioned to do the opposite. At the conscious level, there is a fairly straightforward explanation for this. When a trade is a winning one, we are acutely aware that we can only crystallise that profit by selling the position. Conversely, when a trade is losing money, we are psychologically reluctant to turn a paper loss into a real loss (‘loss aversion’). Two further behavioural biases which we need to guard against are ‘priming’, which describes a scenario where perception is confused with subconscious recent memories, and ‘cognitive ease’, which can be defined as a tendency to base decisions on instinct and intuition rather than deductive reasoning and hard work. In order to discover the extent to which the performance of asset managers is inhibited by such behavioural biases it is necessary to conduct extensive analysis. Having highlighted an individual’s strengths and weaknesses through objective feedback, the establishment of rules becomes a critical element in enhancing the quality of investment decisions (‘skill’). Third conclusion: It is important to recognise that length of experience is of little value if fund managers remain unaware of their strengths and weaknesses. The process of providing and heeding objective and multi-faceted feedback is essential in cultivating the skills of experienced managers, helping them become more consistently successful. In conclusion, large parts of the asset management industry achieve disappointing results because they are not culturally-equipped to succeed. For the most part, asset managers are still considered to have an innate talent that is denied to others or a superior intellect that requires no development. Experiments in social psychology suggest that people who are lauded for their talent become scared of making mistakes for fear of looking unintelligent. If this mantra is applied to the asset management industry, ‘talented’ individuals are likely to construct portfolios that closely resemble their benchmarks. Statistical data confirms this. It is our firm belief that the best asset managers display considerable skill in portfolio construction and trading. Indeed, this assertion is backed by a number of studies7 in which the authors seek to differentiate between the performance persistency of the best and worst managers, rather than dealing with the entire universe of ‘active managers’ at the aggregate level. The best-performing managers are those that run winners and cut losers. However, this concept is completely alien to the human psyche. Consequently, individuals need to be coached to overcome deeply-entrenched behavioural biases such as priming, cognitive ease and loss aversion. As we have seen, there is a wealth of research into such psychological and behavioural traits but most asset management firms have not begun to confront the issue. Conversely, it is our contention that no active risk management framework can be complete unless it includes a process for addressing the behavioural biases inherent in poor decision making. Objective feedback relating to both winning and losing positions can foster a greater understanding of the fundamental question ‘How do I make money?’ The ability to answer this question provides asset managers with the potential to move away from a random, luck-influenced world and onto a path of repeatable, skill-based success. Source: ‘The economic implications of passive investing’, Woolley and Bird (2003). Source: ‘Best Ideas’, Cohen, Polk and Silli (2009). ‘Self-theories: their role in motivation, personality and development’ (1999). Source: ‘Reasons for confidence’, Koriat, Lichtenstein and Fischhoff (1980). From ‘The Talent Code: Greatness isn’t born. It’s grown’. Examples include ‘Can mutual fund ‘stars’ really pick stocks? New evidence from a bootstrap analysis’ Kosowski, Timmermann, Wermers and White (2006) and ‘Do hedge fund managers have stock-picking skills?’ Gray and Kern (2009).